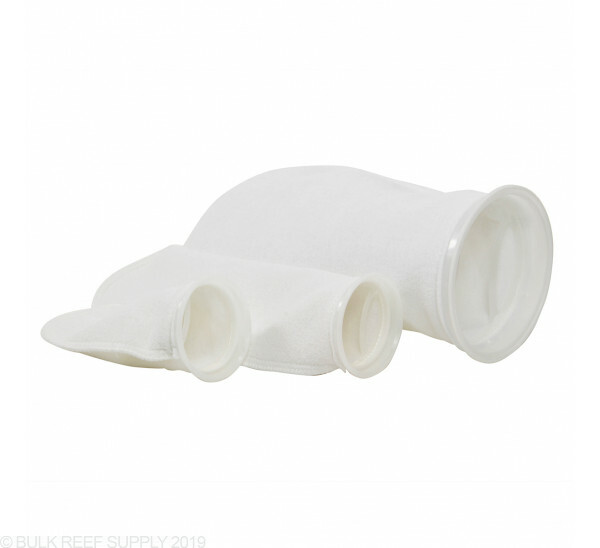 Felt filter socks give the best qualities of trapping free floating debris to give your tanks water that crystal clear appearance. Felt filter socks with the plastic rings make replacement quick and easy, and most sumps will readily accept the BRS felt filter sock. 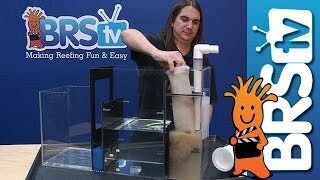 In most cases we will always put felt filter socks in our sumps. Felt Filter Sock is better at removing particles than mesh but can clog faster. The plastic ring fits common sump holders. Filter socks come in mesh or felt and with a plastic ring or drawstring. Normally they are great. The last two I ordered though don’t fit into the 4” sock section of my sump. I have to force these two socks into place and usually takes 15min to accomplish. Usually they are easy to place, clean and reuse. Not sure what’s up with the two I got most recently. I waited before reviewing these socks to see how well they held up. Now that almost a year has passed, I am ready to pass judgement. These socks have held up very well. I use 1 of the 14" and 2 of the 8" socks in my Trigger 39 sump. I have 5 sets so I can change them out roughly every 3 days and then wash them as a batch every 2 or 3 weeks. I wash them on a hot sanitary cycle with a large amount of bleach. After 20+ washes in these harsh conditions they show almost no signs of thinning. I was expecting to have to replace them months ago. No stitching problems with any of them. Great product that has far exceeded my expectations. These filter socks hold up remarkably well. I wash them once a week in a washing machine and they come through with minimal wear and tear. I prefer the 8" deep socks because they are easier to turn inside out for washing. Very happy with these mesh socks. I don't use them all the time, but have three 4" socks in rotation that I put in place in on my DIY sump drain line when doing water changes and stirring things up. They do end up getting clogged after about three days the way I use them, but that equates to changing out about twice a week, the sweet spot from one of the BRS TV videos. Once clogged/dirty, I rinse out in the sink with high flow warm water and put in the sun to dry. Have lasted a good while. Fit well in the BRS sock mount, but have found a magnetic mount that works a little better. I keep buying these because they are great and priced right. after i bought my first sump 10 years ago from a different site it didnt come with extra socks and that same site didnt carry or sell the socks i searched the web and asked around and found them here cheap enough and bought a few different sizes in length and use the in my sump when 1 pair gets dirty i change them out to a clean pair i use a garden hose which has a lot more pressure than a sink faucet or i thow them in the laundry and use a non clorine detergent to wash them then the next time ive gotta change them i just rinse them under my faucet to make sure theres no detergent or residue left in them from the wash before i put them in my sump they ladt awhile especially if youre using multiple pairs rotating them each time tour doing a water change and theyre dirty.. These socks are thick and sturdy. Hold up to many machine washes. These socks are better than any other I've ordered. What can I say, they are filter socks that do what they do. As long as you keep them then no problems. I bought a few of these socks, construction is solid. Great to have around as mechanical filtration. love me. Traps a lot of waste. I have gotten 10 of these and they work great. The stitching stays together through every wash I have given them. Good question. All of our filter socks are 200 micron filter socks! I use the felt sock with the plastic ring and would like to know how people clean them. Some folks just throw them in the washing machine when they collect enough dirty ones. Personally I turn them inside out and give them a good rinse and scrub by hand. I have ordered about 6 of these for my sump they work great except they never seem to completely seal in the opening. Is there any O ring I can use or, can I put a heavy rock in the bottom of the sock to hold them tighter to the opening? Are these polypropylene or polyester? The 4x 8 will work great additionally we have used the 4x14's as well which allow for a little more time before changing. Would the 4" be compatible as replacements for the socks that come with the CADLights SAIO series? We are not familiar with the CAD lights sock size. As long as the hole for the filter socks is 4" exactly our filter socks will work great! Feel free to let us know if you have any further questions! What is the inside diameter of the plastic ring for each of the sock sizes? These filter socks have a lip which makes the inside diameter not very important for measurement. These will fit inside of a 4" diameter hole perfectly however! Feel free to let us know if you have any further questions! I have a Precision Marine Sump 48 Pro which is labeled to have 7" holes for the Filter socks. Does that mean I purchase the 7" x 14" socks? Will these work in the Emerald 34 sump? The BRS filter socks with plastic rings work great in the Trigger sumps. Many of us here at the office use them for just that! Hello would this fit the reefer 250? Tried other 4 inch ring but no luck so far. This will not work in the red sea reefer tanks unfortunately. The only socks we are aware of the if the socks directly from Red Sea. Feel free to let us know if you have any further questions! Is it acceptable/advisable to put bio-media in the socks such as Seachem Matrix or Brightwell Aquatics xPort Bio? You can put any type of media you choose into the filter socks, however for a media sock, we would suggest using the mesh socks over the felt, since little particles of media, like getting stuck in the felt socks and become a bit harder to clean over time. The mesh socks handle loose media much better while allowing for more flow through them. The felt socks are best for water polishing. I've been using the 8" socks with good results - their also very durable and machine wash well. 1) Is using bleach necessary when machine washing? 2) What's the best way to tell when these socks need to be replaced (because of age/wear and no longer effective)? 3) If I wait too long will that contribute to an increase in nitrates? 1) It isn't necessary (many people just use straight water) but bleach does a very good job of breaking down organics. 3)If you leave them in the tank to long it won't be as effective. It is more of an opportunity cost, by leaving the sock in for too long you give a chance for detritus to contribute to the nutrients in the tank, whereas if you had changed it out you would have removed it from the tank before giving it the opportunity. In the end, there won't be any more nitrates then could have existed without it, but you missed your chance to prevent them if you don't change them. What is the correct size for a aqueon #1 sump? Either of the 4" filter socks will do the trick. I personally prefer to use the 14" even if its a bit long. How often do you normally recommend you change the filter socks? what is the best method to clean the socks? if soaking - in what solution? The more often you change them the better, that way you can remove the solids before they continue to break down and add additional nutrients to your water column. You want to avoid soaps when cleaning them but its pretty common for people to use unscented household bleach in water. Be sure to rinse them and all them to dry completely.